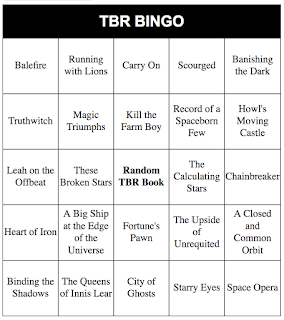 So... let's talk about how well I did on my Spring 2018 TBR Bingo card. The answer is okay. I've been in a major reading slump since I finished Obsidio back in March and I'm just getting out of it. I'm hoping I'll do better with my Summer Bingo card. 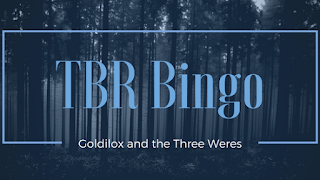 While no bingos were acquired, I read two TBR books on my card plus the random TBR book and had one DNF. So not bad considering I was in the worst reading slump I've had in over five years. After evaluating how I did with my spring card, I realized that I read an equal amount of new releases and older books this last quarter. So I decided to put more backlist books on my summer card to catch up on my #beatthebacklist challenge. And I added a good mix of 2018 releases that I've just bought or have on pre-order. I'm also only going to use this bingo card through the end of August instead of going through September. I have a ridiculous amount of pre-orders for September and October so I'll do another card for those months. I thought I'd share seven of the books I'm hoping to get off my TBR pile in the next couple of months. While I'm hoping to get a blackout and read all 25 books on my card, these are the books that will have the highest priority. After rereading The Long Way to a Small, Angry Planet last month, I'm ready to finally read this beauty for the first time! I'm so excited to learn more about Pepper and Lovelace from the first book! Plus, once I finish this book, I'll be free to start A Record of a Spaceborn Few as soon as it hits my Kindle on July 24th! I adored Mary Robinette Kowal's novellette, The Lady Astronaut of Mars when I read it a few years back when it won the Hugo Award. So when I heard she was writing a prequel series to that story, I was ecstatic! It's basically an alt-history space race where Washington DC is hit by a meteor and we have to speed up our efforts to colonize space before the Earth becomes inhabitable. The author says she drew inspiration from Hidden Figures and based the main character off of a lady scientist from the Jet Propulsion Lab back in the day. I'm am so here for this book and can't wait to have it in my hands! I binge read all of the previous books in this series last summer and it became one of my favorite series of all time. I have been not so patiently waiting for this book to come out since then especially after that teaser we got at the end of Draakenwood. I have a countdown going for when this book will hit my Kindle and I need the next nine days to go by faster! My beloved Kate Daniels series is ending next month and I am both ready and not ready for it. Reading Iron and Magic last month made me super excited to see how the series ends and how the duo of Ilona Andrews will add to this world post the Kate series. As excited as I am, I'm also sad that it'll be the end of the series as we know. Right now, my excitement outweighs the sadness so I can't wait to have this book in my hands! Next month we get the first of this year's two new Victoria Schwab releases and I'm so excited to read them both! City of Ghosts is her new middle grade about a girl who sees ghosts and one of them is her best friend. And it's set in Edinburgh! I really don't know much about it other than that but I know I'll probably love it like I have all the rest of the Schwab books I've read. I hadn't heard of this book until recently but once I did I had to get a copy! It about a washed-up treasure hunter, a galactic racer framed for murder, and a deadly secret society all racing against time to find the greatest warship ever built! Add in that it’s been compared to Firefly and I am totally here for all of it! Last but not least, I have the Kevin Hearne and Delilah Dawson collab that I never knew I needed until they announced it. It's being touted as Shrek meets The Princess Bride and I am so ready for it! It's promised to be very punny and full of laughs and I can't wait to get to my ARC of it! Can you tell that I am in a major mood to read sci-fi? 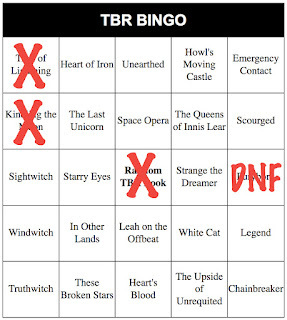 I really hope I can get to all of these in the next couple of months but if I don't I'm hoping to get at least two bingos. I really am excited to read all of these and to check them off my physical TBR. I'm keeping my fingers crossed that I'm done with my reading slump and won't slack off this round like I did the last one. What books are you excited to read this Summer?